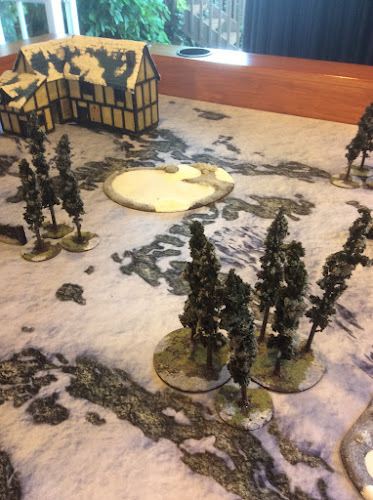 I have a bunch of Winter terrain that the local GW gave me about 10-12 years ago. 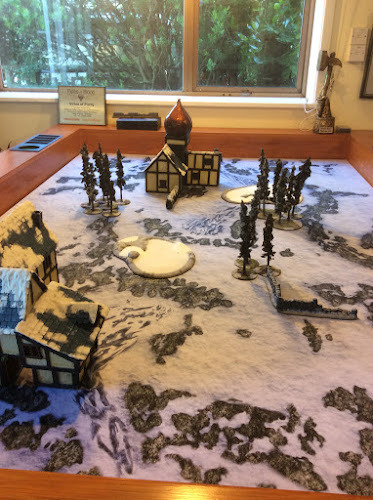 It includes some buildings that they built for their "Kislev" themed table at the time of the Storm of Chaos campaign. 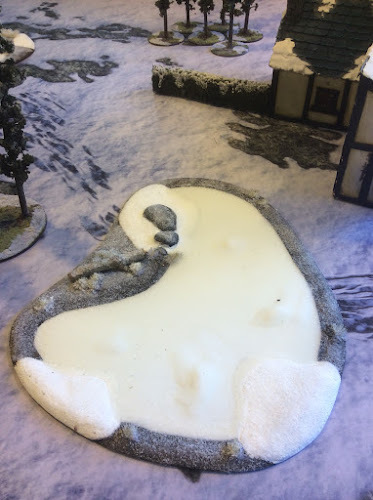 Over the years I have built hills to match and grabbed a Snowy Terrain F.A.T. Mat to go with it. Last week I picked up some winter ponds from GF9 and over the last few days have worked on them to create frozen ponds for my "Kislev". The ponds come very unadorned so first I filled the water area with Realistc Water resin and used snow flock to build drifts in the pond and snow on top of the ice. I then added Winter Tufts onto the bare areas before sprinkling flock all around.by one pond I placed a log then built up drifts on and around it. Finally I sprinkled a series of light coats of flock over the earth areas to approximate newly fallen snow. Both ponds were then sealed with Scenic Cement which you spray on to fix the piece ensuring nothing comes off. You can see the finished ponds on my table and they fit nicely into the frozen wastes theme. They also will provide the low difficult terrain that the game suggests. Very happy how they turned out for minimal - USD 25 - cost and about two hours work. 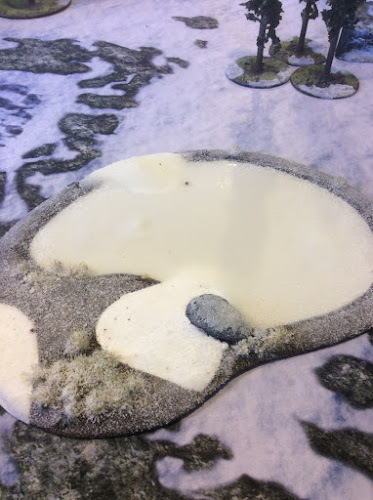 They will provide the necessary terrain variation that the table needed, are easy to store and should last pretty much forever. Your terrain is always outstanding. I hate to think how much storage space it takes up now. Sure a much greater magnitude than your Miniatures!